It is not a myth that gorging on your pasta while watching your favourite TV show or eating out at a noisy restaurant is bound to make you eat more. The study, published in the American Journal of Clinical Nutrition, looked at 41 women, most of whom were of healthy weight but were those that controlled their eating quite consciously. The women were presented with the same meal on several different occasions, over several weeks, in different circumstances: alone, alone with a recording of advice on eating, together with other women, or alone but with a recording of a TV show as a distraction. The findings showed that when distracted, the women ate significantly more food, despite not being hungrier. Although this was a small study, the findings were convincing enough to support the long-held view that distracted eating is not healthy. So, if you want to lose weight, try these tips for staying alert. Don't eat in front of the TV. Eat with the rest of your family gathered at the dining table. Keep the pots and serving dishes in the kitchen; not in front of you. You're likely to have a second serving if the food is in front of you. Be careful about the portions you serve on your plate. If there are leftovers once you’ve served yourself, pack them away immediately.. Taste your food. Be aware of what you're putting in your mouth and consciously enjoy it. Savor every bite. 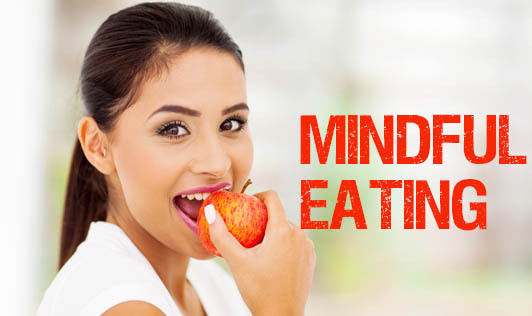 Eating Mindfully is one more tool to use in weight management. In addition to being in control of your weight, you'll be surprised that being present and aware when you eat can actually make food taste better!